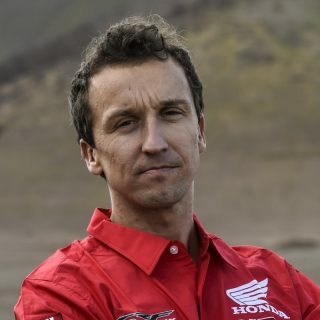 The brutality of the Dakar Rally today showed its most bitter face to Monster Energy Honda Team as Ricky Brabec was forced out on stage eight. 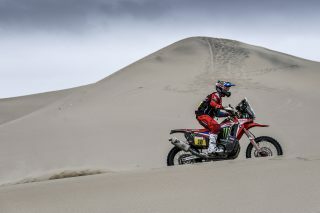 Nacho Cornejo opened the track throughout almost the entire special and Benavides got delayed with navigational instrument issues. 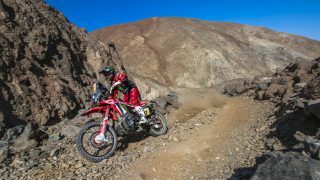 It was an endless, troublesome day for the Monster Energy Honda Team riders who suffered the harshness of the Dakar Rally, particularly for Ricky Brabec, who was forced to abandon the race while still holding top spot in the general standings. 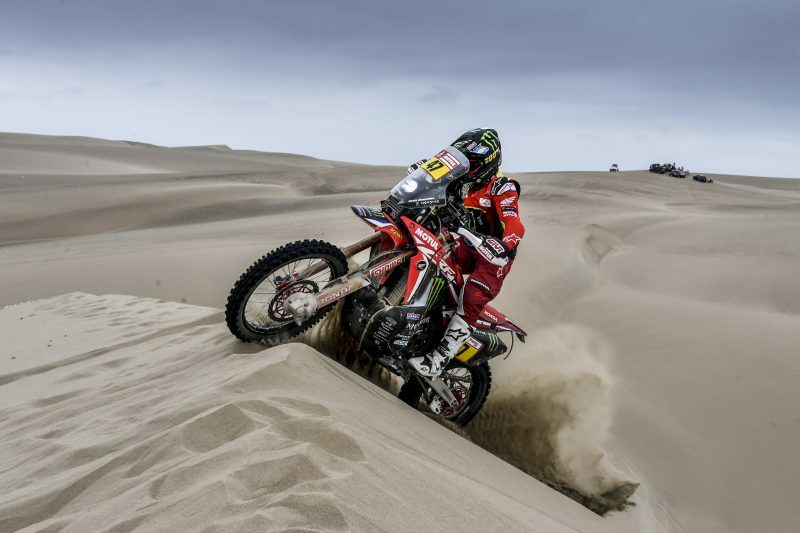 “It was a shame, but I will go away happy with the good pace that I have set in this Dakar. 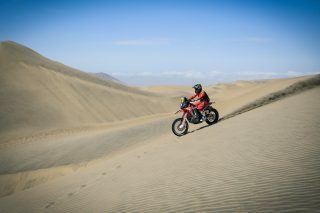 I will return with even more motivation next year,” stated the American as he arrived back at the Pisco bivouac. 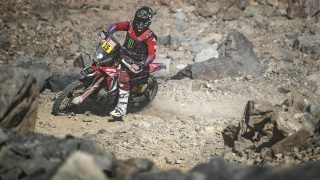 The eighth stage, the ‘Super-Ica’, got underway this morning with a mixed car and bike start which saw Nacho Cornejo and Ricky Brabec head out onto an open track with the pair both intent on obtaining crucial results in the special. Nacho was forced to open the way given that Sunderland claimed to have a bike issue and consequently started later. The Chilean was thus lumbered with the weight of opening throughout almost the whole day. 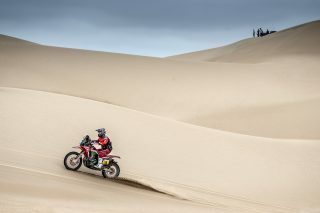 Only towards the end was he briefly passed over a couple of kilometres by the car of Peterhansel who eventually got stuck in the dunes. 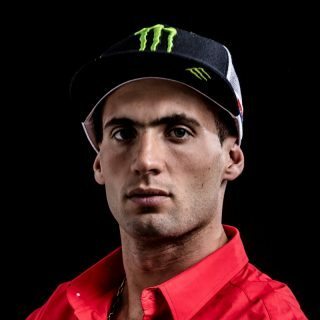 Despite the handicap Cornejo performed valiantly on a high-speed, error-free ride to wrap up the day with the eighth fastest time. 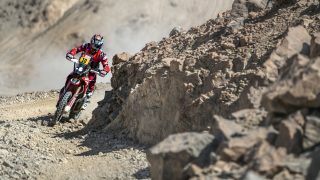 Meanwhile Kevin Benavides had to endure a problem with the navigation equipment during the 361-kilometre special, which delayed the rider considerably. 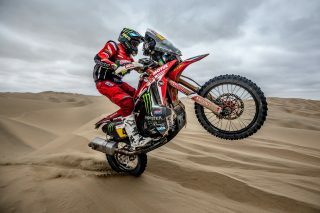 The Argentine Monster Energy Honda Team is sixth in the race overall. 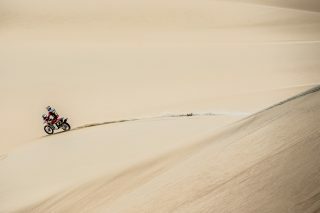 Tomorrow Wednesday sees the penultimate stage of this 2019 Dakar Rally which will once again be held on a looping circuit, this time from Pisco. 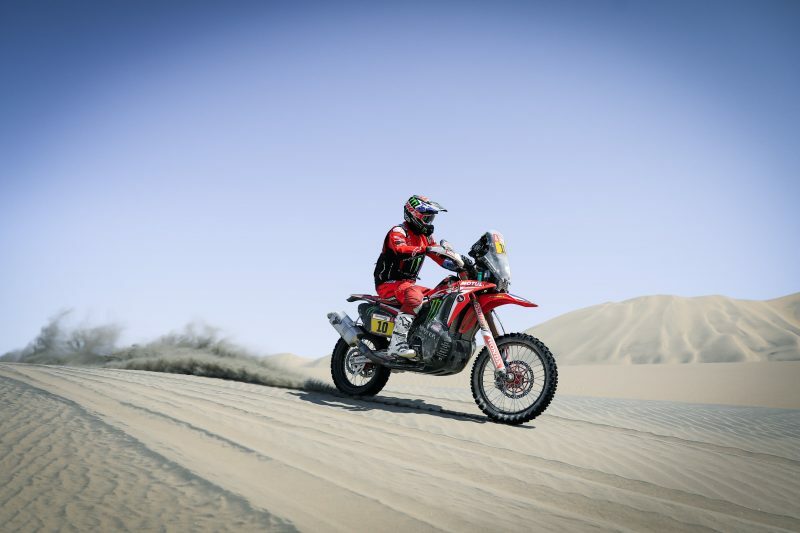 There race will include 313 kilometres of timed special stage out of a total of 410 kilometres on the day. Today was a long day. I’m happy because I opened almost the whole special, except for a few kilometres when a car overtook me. 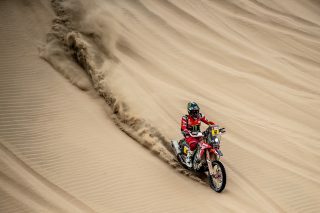 It was very difficult to open the track all day in a very sandy stage, off-piste and in open desert, so I’m very happy with today's stage. 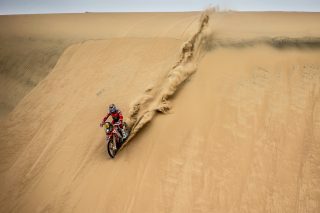 I think it will help me in the future, you learn a lot by opening the track. 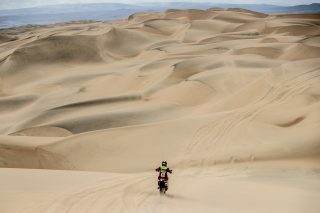 It's a pity that Ricky had to retire, he was having a great race. Everyone was impressed because he was very solid. It encouraged him but also the whole team. 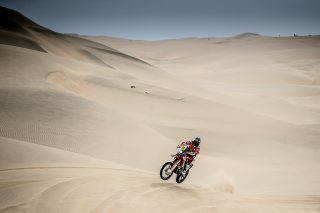 Now we have to keep pushing forward, there are still two days left and everything can happen. It was a really hard day. 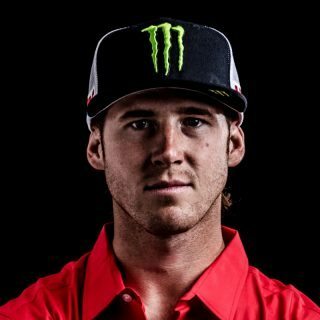 There was nothing really positive about my day, especially for the race. The coolest part was getting a helicopter ride along the beach and back. It’s heart-wrenching. Not easy. We have to go home, take a break and come back. I’m at a loss for words. It was amazing to be on the top for the previous days. It’s really nice to have the team support me and the whole team. It felt like the vibes and the confidence in me were good. That helped me to achieve so many great days. Today the stage was complicated because I wasn’t able to validate a waypoint. It was a point which wasn’t visible but should have been very easy to find as it was just down a mountain as you entered the beach. I was at the right point and but the waypoint wouldn’t open. I went through there a thousand times and nothing showed up. I stopped Joaquim Rodrigues, he had it validated and I was at the same point and it wouldn’t go on to the next waypoint. 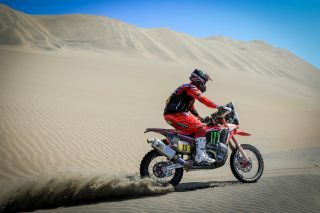 Several other riders passed and after I stopped Michael Metge before the point and told him if I could follow him to see if it registered. Finally it did but I had already passed through many times. The organisation has seen that I went through there many times. Now we have to wait and see what they will tell us about it. It’s a pity about Ricky, he was having a great race and we could have both battled until the end. I send him all my best. Unfortunately, days like today, we have experienced before. These are things that can happen in motor sports and that, far from bringing us down will serve to strengthen us as a team because we will continue to fight for our goals, even if they are distant. 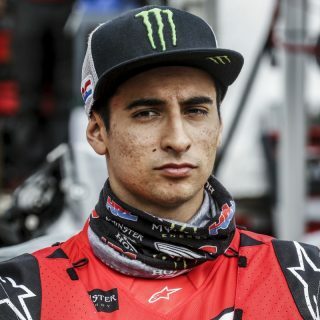 Ricky was having an incredible race and I'm sure he will come back, even stronger if it is possible, to continue fighting for the number one spot. Likewise, I’d like to point out the great stage that Nacho Cornejo rode today having opened the track all day, but also that of Kevin, who had some problems with the navigation tools that we hope can be solved. We will keep fighting until the end.